It’s a weird quirk, a bit of anxiety, I admit. The fear of not being busy. The fear of boredom. So I just make sure that that doesn’t happen. 2012 makes it pretty easy. A small part of me appreciates knowing that, while I don’t always want to be “plugged in,” I have the option. My buttons are still turned on, my batteries charged, even when I’m in sleep mode. The fact that I can receive that email at any time, whether I want to or not, at least means that I’m alive and needed. And then, there are writers (and bloggers! ), artists, musicians, journalists. If I’m faced with empty time, I can read, I can look, I can listen. My modest, yet still stacked, cookbook collection assures I’ll never know what boredom is. I will forever be a student; there’s too much discovering to do. When I flip through their pages, the hours feel like minutes. When I cook with them, I’m dancing — a splatter marking an active period in time. Dancing ≠ boredom. But this spring, I think my palate has been just a little bit bored. My dessert palate, that is. Bored because it has sat there, savoring other very good things but patiently waiting for rhubarb — for its brilliant ruby hue and its bright, almost acerbic, bite. I want it to knock me over the head, to, like the ding of that email or the beautiful quote from a novel, wake me up cold. Sure, that banana cream tart was, quite literally, heavenly. But it didn’t shock me. It didn’t bring color to my pale cheeks before the sun gets its chance. Rhubarb has this power. And I have waited too long; rhubarb has been in season for a while. I knew I was going to start this season with roasted rhubarb; it’s the best way I know to treat those long stalks without gussying them up. I don’t want to temper them with strawberries or ignore their rough, celery-like texture by making a compote or purée. Just a little sugar, a little citrus, and a little heat are all they need. I paired it with something creamy and just rich enough to offset the rhubarb’s potency, but not so rich as to coat or take away from the pungency I was craving. 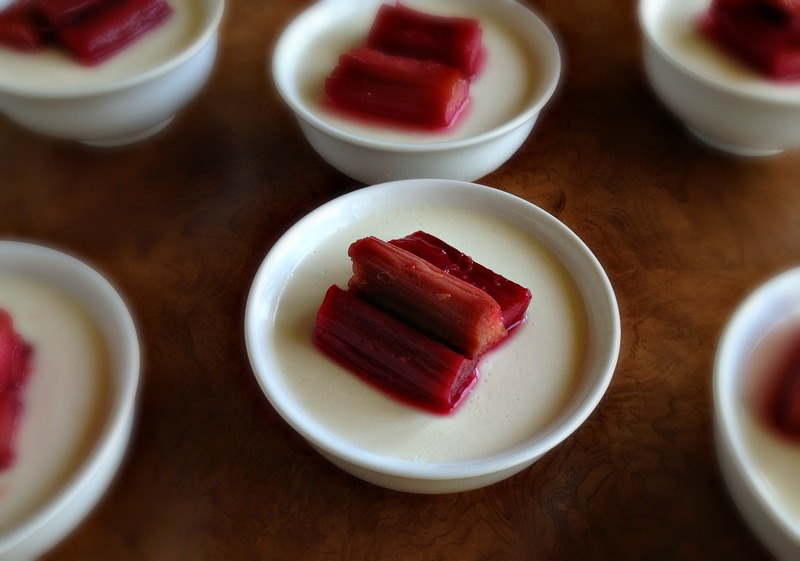 Panna Cotta, which I dressed up with some floral honey and heady cardamom, proved a fragrant cushion for that sticky, sour rhubarb. I decided to go half heavy cream, half greek yogurt to play off of rhubarb’s tang. Now it’s on to some of my other favorite things: pickled rhubarb, rhubarb crumble, and maybe a rhubarb-studded cake, because I cannot stand being bored again. I tested this in several vessels to find out which would be most attractive. My favorite were these small dishes, equivalent in size to standard 6 oz. ramekins, which also work great. I also love them in wine glasses. I don’t like to invert these, as I find it difficult to chase the roasted rhubarb topping around the plate and slurp up its juices, but if you’d like to plate it this way, oil your dishes before pouring in the mixture. In a small saucepan, combine cream, honey, salt, and cardamom. Heat over medium, swirling and stirring from time to time, until honey is completely dissolved, mixture is homogeneous, and bubbles start to form around the edges. Take off heat and cover for 30 minutes. In a medium bowl, whisk yogurt until completely smooth. In a small bowl, spinkle gelatin over tha water and let stand for 5-10 minutes. Reward the cream. Scrape gelatin into the pot and whisk vigorously to dissolve. Pour mixture through a sieve over the yogurt and whisk to combine completely. Using a 4 oz. ladle, divide the mixture among the ramekins. Let sit on a cooling rack until just warm, cover and refrigerate. Let set for 4 hours. They can be stored in the refrigerator for 2-3 days. Adapted from Around My French Table, by Dorie Greenspan. For the original recipe, check out the book. Yes, I realize I’ve been featuring a lot of Dorie-inspired recipes lately. What can I say, I’m on a Dorie kick after not having used her books for quite some time. 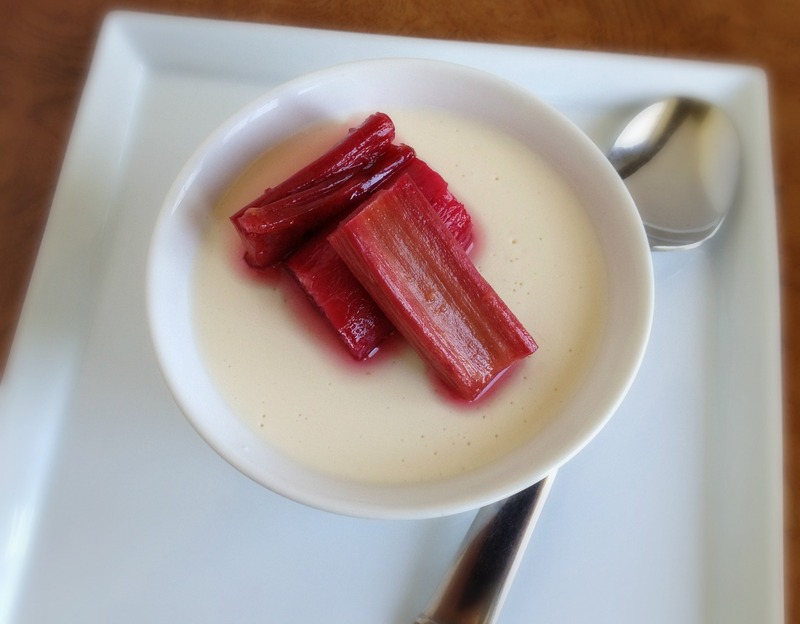 Once roasted, the rhubarb can be eaten hot (please, please, take a bite hot from the oven), at room temperature, or cold. For the panna cottas, I like it at room temperature. Not a panna cotta fan? I love it warm over ice cream or frozen yogurt and I also store a batch in the fridge to top off my morning yogurt. Although this isn’t shown in all of the photos, I like to adorn the panna cottas with the rhubarb pieces along with the juices (as seen in the wine glass). Not only is it beautiful, but it’s delicious. Chop rhubarb into 1 1/2 inch pieces. Place in a baking dish large enough to give the rhubarb pieces a good amount of space–I use a 9 x 13 Pyrex. Add sugar and zest and toss until all rhubarb pieces are covered. Let mascerate for about 10 minutes until a small amount of juice starts to collect in the dish. Cover with foil and roast for 15 minutes. If at that point, the sugar is not completely dissolved, recover and roast for about 5 more minutes. You want the stalks to be soft but you also want them to keep their shape, so don’t overcook. you have such talent, i get lost in the words of your posts! and this dessert looks right up my alley. reminds me of one I had at the ISGM cafe! Wow, that means a lot–thank you! And I just looked back at that post. I almost forgot about your dessert there. Maybe I was subconsciously channeling it! First of all, this looks stunning. Absolutely stunning. That rhubarb looks so decadent. Also, I must say I really enjoy your writing. Thanks, that’s so kind! I should have mentioned that part of the reason everything was so good was that I’ve been able to snag some very, very good rhubarb lately. 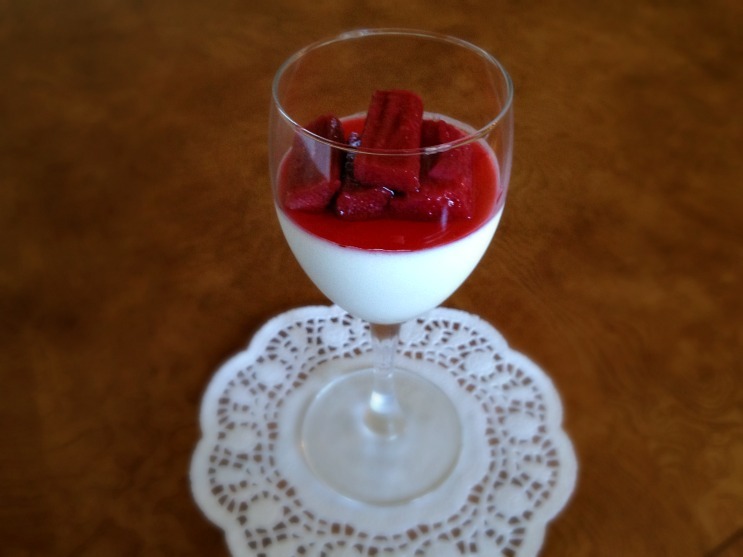 I love panacotta and find it works best with something sweet & sharp for contrast to all that cool creaminess. 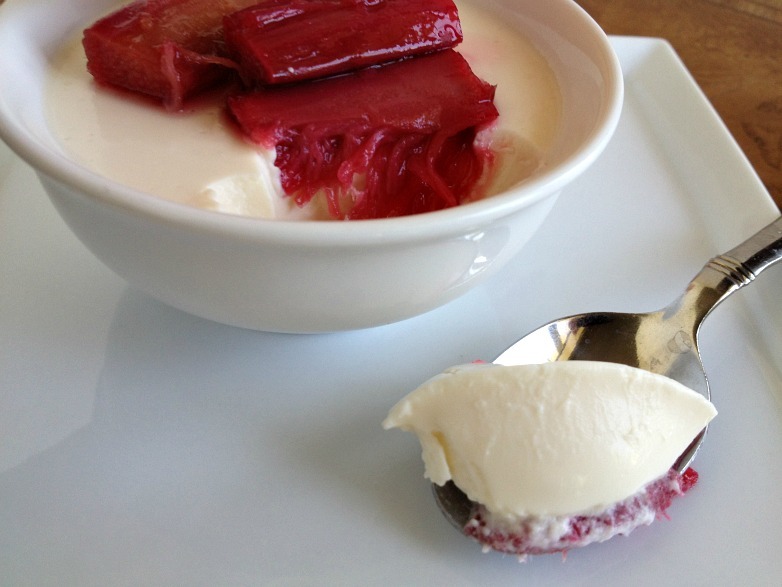 This looks absolutely perfect & the colour in your rhubarb is beautiful too. I made something just like this last year (the year before?)! 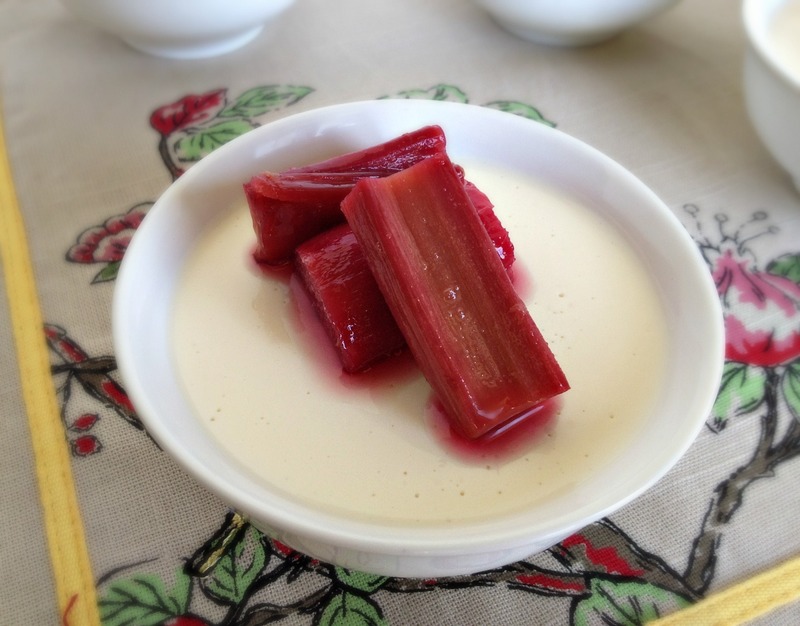 I don’t think there was honey, but I definitely did a cardamom panna cotta and rhubarb compote. It was actually for Flour… we decided to do a little staff baking contest with rhubarb and that was my entry. It wasn’t the winning recipe but I thought it was pretty delicious! That’s too funny! Those flavors just go so well together. Beautifully written. I always think about whining that I was “so bored” when a kid. Can’t imagine that now! And, oh my, that dessert looks and sounds just divine. I am the same – I have a hard time letting myself get bored and so I am always keeping myself so, so busy. This looks great, especially paired with panna cotta.